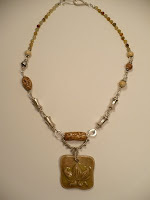 Sharon over at Livewire Jewelry has a wonderful giveaway going. Move fast, you'll get there just in time !!!!!!! Isn't this a beautiful necklace..........hope I win it ! Paula....WOW..loove your paintings, and I need some more time to look over all of your blog, but I adore the look of it! Thank you so much for visiting my blog and spreading the news, I really appreciate that! That is a lovely necklace, I hope you win it too :-).